The Commodore is enjoying 34’ of heat on the beautiful coastline of Fremantle. Ben is enjoying the sailing here, so far in winds of 18-27kts. The worlds started yesterday with very challenging conditions and finishing was a good result. Today is very different and we’re waiting for the “Fremantle Doctor “ (the regular sea breeze) to kick in and deliver 20kts. Managed to dodge the sharks so far! Brunch cooked by members of the General Committee, under the guidance and support of Martin Swindon & Mick Kilkelly, on New Year’s Day. Mindful waistbands aren’t the only thing tight at this time of year we have reduced ticket prices from last year. Tickets £7.50 per person (Children £4.50) on sale now behind the bar or from the Office. You’ll need to select your sitting when you buy your tickets. You are welcome to arrive at any time and we would encourage you to stay around afterwards but we will need you to vacate your table at the end of the sitting you have booked – this is so we can accommodate as many people who want to enjoy Brunch – this is a very popular event and a great way to start the New Year. The brunch is a ticket-only event (the bar is open to all) and places are limited, please buy your tickets as soon as possible to avoid disappointment. The bar will be open serving Bucks Fizz, Bloody Mary and all your other favourites. It’s nearly that time of year again, mince pies and punch in the bosun’s hut on the 6th and a bit of racing too, so break the ice from your cover and come for a sail in the Frozen Sheets, note the SI’s for the winter series cover the Frozen sheets, Note that the frozen sheets is a Mass start. We’ll have a briefing in the bar beforehand around Midday. Once in ‘Dropbox’, click on the first thumbnail and then scroll through. New Year at the Club! The club will be open on NYE to members who wish to join us in seeing the New Year in. There will be music and children and guests are welcome too. No ticket necessary. New Years Day the club will be open and serving brunch. Tickets on sale, from the bar, today. FULL SX MODE WITH 16:1 DOWNHAUL + HARKEN 9:1 CARBO MAINSHEET. 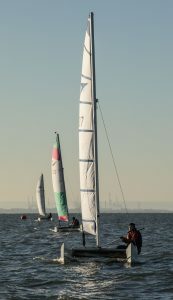 VERY FAST BOAT IN EXCELLENT CONDITION AND READY TO RACE. COMPLETE WITH FULL SIZE TOP COVER, CAT TRAX WIDE WHEEL LAUNCHING TROLLY AND GROUND BOX. SQUARE TOP MAIN. ALL SAILS BY HYDE AND ALL IN VERY GOOD CONDITION. ALL NEW RUNNING AND STANDING RIGGING IN FEBRUARY 2016. FRONT AND REAR BEAMS REPLACED IN 2013. NEW SPINAKAR CHUTE, NEW SPINAKER POLE, PLUS 2 NEW SETS OF SLOT GASKETS. NEW HARKEN CARBO RATCHET MAINSHEET BLOCK NO 2141. STILL HAS PRICE TAG ATTACHED. NEW CROSS BAR AND GLASS FIBRE TILLER EXTENSION ORIGINAL TWIST STYLE. NEW GILL TRAPEZE HARNESS STILL BOXED. SPARE TRAMPS X 2 FULLY SERVICABLE. SPARE JIB – USED THREE TIMES. 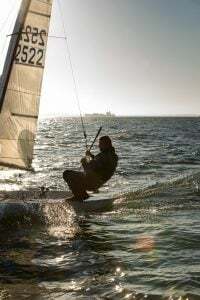 SPARE SPINAKER – STILL CRISP. SPARE BATTENS X 2 SETS. PLUS BOX OF VARIOUS BITS AND PIECES. FANTASTIC BOAT READY TO RACE + WIN. 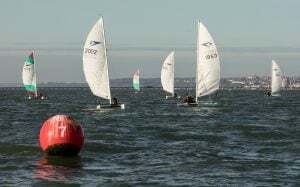 LAST SAILED IN PETER HAYES TROPHY IN AUGUST 2017 AND CLEAR WINNER BY 3 MINUTES. Calling all Cadets – Santa is coming! Don’t miss out Tickets for the Cadet Christmas Party are now on sale behind the bar. The bargain price of £5.00 each includes a jacket potato meal with various toppings and an ice cream dessert, the usual disco and games, plus of course a visit from Santa (there’s a rumour he’s bringing gifts)! The evening lasts from 4pm to 7pm. So get in quick – numbers are limited and it is likely to get booked up fast. Dig out those festive outfits and hats and come down for a bit of Christmas cheer! The boring small print:- Food service will be between 4pm and 4.30pm – please arrive as close to 4pm as possible as all tables will be cleared away at 5pm in readiness for the disco and games – no food will be served after 4.30pm and no refunds will be given. Tickets are available to MEMBERS ONLY – your child’s name will be required in order to book. It is not possible to reserve tickets and payment is required up front. I have now had the final account for donations to the RNLI in memory of Brian and they amount to £981.75. My family and I would like to extend our grateful thanks to all for their generosity. It is very heartening to know that Brian was held in such high regard.